Sure the "remain" side in the EU referendum suffered a narrow defeat, but the Labour Party has lost in much bigger defeats and didn't abandon its policies, so that's not reason enough. The EU tends toward the political centre ground, so is incompatible with extreme policies on the left in the same way as the right. Because the majority of the people voted for Brexit. Thus, ex-post the referendum, the Labour Party accepts it because it is the will of the voters. As simple as that. But then, someone might ask: "but why does the Labour Party accept the referendum?" My tentative answer is: because the LP wants to be a popular party. Unlike the Lib Dems, for instance, who ask for a second referendum, the LP understands that (i) those who voted Brexit want Brexit, and (ii) most of those who voted Remain respect the referendum result. Thus, respecting the referendum is the only choice of a party aiming to be popular. A Labour government will never consider these rights a burden or accept the weakening of workers’ rights, consumer rights or environmental protections. We will introduce legislation to ensure there are no gaps in national security and criminal justice arrangements as a result of Brexit. This is quite a left-wing line, which highlights that, even after Brexit, workers' rights and environment would be protected under LP-driven Brexit negotiations. Thus, in conclusion, the LP supports Brexit because Brexit won the referendum. They are as such, quite pragmatic, whilst still aiming to keep their (Corbyn's) left-wing ideas in place. At the moment the issue seems to be less one of policy and more one of narrative. The Conservative Government is currently in charge of delivering Brexit. Nearly two years after the vote to Leave the EU, we still have no idea what a deal is going to look like in, well basically any particular. This is compounded by the resignation today of Britain's chief negotiator, David Davis and the Foreign Secretary Boris Johnson. There would not seem to be any political capital for the Labour party in offering any distraction from the current Government's problems. For, against, half-in, any statement at all from Labour simply allows the Government to change the narrative of the news cycle from their problems, to how Labour is seeking to; "Over turn the referendum", "sacrifice the economy for ideology", "abandon the workers", delete as appropriate. I think the notion that Labour supports Brexit needs to be nuanced a little. There's a May 2018 opinion piece in the Guardian (by prof. Anand Menon) that describes Labour's support for Brexit as "strategic ambiguity" because while supporting the result of the referendum, the LP doesn't really have its own clear plan for how Brexit should happen. As you noted (and nicely detailed in Menon's analysis, which is agreement with another one from JRF, Labour's electoral gains (in seats) depend on constituencies that are pro-Brexit. Labour’s decision to embrace departure from the EU in some form may have helped them reframe the election around other issues such as austerity and public services, and remind voters in Leave areas of their traditional suspicions about the Conservatives. Meanwhile in Remain areas, the party could advance by promising a “softer” alternative approach to “hard” Brexit. The last two paragraphs in particular echo the JRF findings that low-income, pro-Brexit/anti-immigration voters also want broader left-wing economic policies, whereas the paragraphs above those are an example of "softer" Brexit being proposed (on immigration in this case). [A] recent poll by YouGov suggests that even people who plan to vote Labour at the next election are unsure of the party’s position. 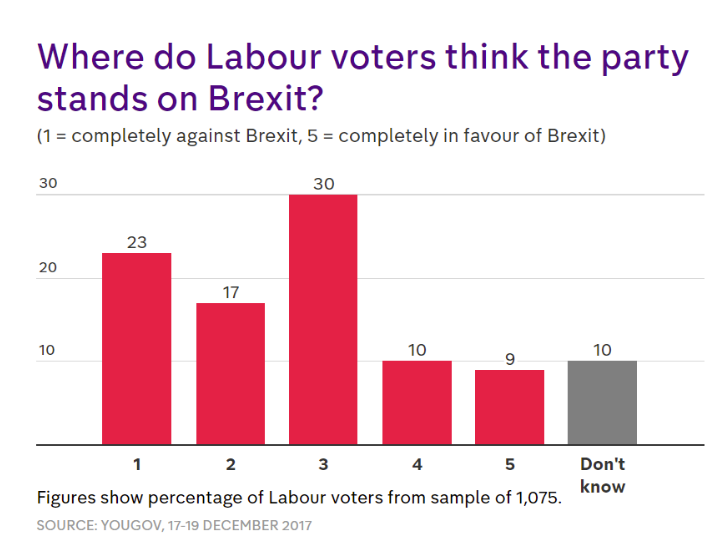 Nearly a quarter said they thought Labour was completely against Brexit, a third thought the party was on the fence, and a tenth said they didn’t know. Last week, the Labour leadership tabled an amendment to the Withdrawal Bill which detailed its policy of a new single market relationship with the EU, based on "full access" and "no new impediments to trade." "We are confident we can build a new relationship with the EU. We want the UK to have a better deal than the Norway model," Jeremy Corbyn said to the House of Commons last week. Labour's Brexit team believes its willingness to accept all EU regulations and standards would persuade Brussels to be flexible on issues such as free movement. "In France and Germany, they are talking about the free movement of people. Standards are much more important to the EU than immigration," an ally of Shadow Brexit Secretary, Sir Keir Starmer, told BI last month. Reactions from Brussels however were that the proposal was "cake-ism" and "selling a unicorn to paste over their internal divisions" (just like the Tories) as BI reported. And if the question is mainly about Corbyn's position, back in February he supported a customs union after Brexit, unlike the government's view (then and still now) that that's too much. Speaking in Coventry, a city which voted by 56 per cent to Leave, Mr Corbyn said: “We have long argued that a customs union is a viable option for the final deal. East Yorkshire MP David Davis slammed the Labour announcement, saying it would prevent the UK from realising the benefits of Brexit. The Tory Government proposes leaving both the customs union and single market. The Tory position on that has eroded as well since February, but still not as much as to accept a customs union (and call it such). Labour leader Jeremy Corbyn said [...]: "I understand the difficulties MPs representing constituencies which voted strongly for Leave or Remain have on the EEA amendment to the EU Withdrawal Bill. "The Labour Party respects the outcome of the EU referendum and does not support the EEA or 'Norway model' as it is not the right for option for Britain. But it was in the Labour Party where the deepest rifts were exposed. Many of its pro-EU lawmakers went against their leader, Jeremy Corbyn, by supporting the vote [on EEA] and not his amendment which argued for a new single market deal with the EU. Labour's shadow Brexit secretary Sir Keir Starmer said: "Labour will only accept a Brexit deal that delivers the benefits of the single market and protects jobs and living standards. "Labour's amendment, along with a commitment to negotiate a new comprehensive customs union with the EU, is a strong and balanced package that would retain the benefits of the Single Market. Parliament should have the opportunity to debate and vote on it." The "new single market" amendment was however defeated 322 to 240. Also on this occasion, the "customs amendment", which asked only for customs union after Brexit, had broader Labour support, being defeated only with 326 against 298. Jeremy Corbyn, the leader of the Labour Party is a left-winger, far removed politically from the Blairite side of the party. There is a long tradition of the left of the Labour Party having opposed Britain's membership of the EU, and prior to that the EEC. At the time of the 1974 referendum, figures like Tony Benn opposed our joining the EEC, and sat on platforms with Conservative right-wingers like Enoch Powell. The tradition has involved Labour as seeing the European project as a "capitalist club". At the 2016 Referendum, UKIP campaigned strongly in some Labour constituencies, and one third of Labour electors voted to leave. The vast majority of Labour MPs support Remain, some of them like Chuka Ummuna, very forcefully. But for the moment the present Labour hierarchy are reluctant to embrace Remain more enthusiastically, but this could quickly change if there is a groundswell of movement to Remain in the public at large. Tony Blair, the former Labour Prime Minister and many of those who served under him are strong supporters of Remain. Some Labour MPs seem to be having a moral crisis over this issue, and it's unnecessary. Certainly, Brexit won the poll, more people voted to leave than to stay, and that triggered a set of procedural obligations. But it's not correct to go further and say that most people voted to leave, or that the majority of the population voted to leave, because numerically, that's not what happened. Consider the math. Of those who felt sure enough of their opinions on polling day to vote yes or no, the ratio was 51.9% to 48.1% in favour of leave. The turnout was 72.2%, which means that another 27.8% of the eligible population either didn't know, weren't sure, weren't bothered, or decided to leave the decision to people who they felt were more confident about the issues than they were ("let's leave it to the experts who know more about this stuff than me"). So the breakdown of "should Britain leave the EU? ", expressed as Yes/NotSure/No, arguably comes out (with rounding) as something more like a 38 / 28 / 34 split. It's clear who the "first past the post" winner is, but the 38% doesn't necessarily equate to some sort of monolithic "Will of the People" that must not be questioned without one being seen as an enemy of democracy, especially when another thirty-something percent voted for the opposite. It was the will of some of the people, plus the votes of another bunch of people who were persuaded to go along for the ride because they were told that Britain would be economically better off if we left ("more money for the NHS! "), and that our expert negotiators would get us a brilliant exit deal. If neither of those things turn out to be true, then the 62% (and some of the regretting 38%) may blame Corbyn and the Labour Party for failing to be a proper opposition and for sitting back and letting this happen. As the wise folk say, broad generalizations are always wrong, but nonetheless: Globally in industrialized economies, labour parties and unions tend to disfavour globalization and free trade, because it generally is seen to reduce local skilled manufacturing employment by allowing products to be imported from lower-wage economies. The thinking is, we'd have tons of people employed right here in this country, at high wages (and unionized!) making our own cars and electronics and steel, if only we could prevent these things coming in cheaply from over there where people are paid so much less. They will try to gain popular support by appealing to local pride, national preferences in product options, concern for human rights in low-wage countries, and sometimes on grounds of national security and economic self-sufficiency. Conversely, favour for free trade tends to correlate with centre-right politics. Economists see the efficiencies in not duplicating production needlessly in each country, and business owners like the profits that they get from reselling cheap imports. They will argue that importing from low-wage countries tends to build the economies, and thus standards of living and human rights, of producer countries, and that the whole world is richer, overall, than in a system of barriered economies, creating global markets for our exports. And consumers, of course, like to get stuff cheap. That the current US administration is largely anti-free-trade shows that it's beholden less to established corporate interests (who are widely spooked by this round of protectionism) than to mid-to-far-right populist opinion. Part of this reflects the nationalistic ethos of that group; but there's also the phenomenon that's evolved in the for the last few decades, where the R party has captured support from the working class (white) voters as the D party moved into the direction of civil rights, capturing support from more educated, internationally-aware voters. So if you're comparing UK politics to US, basically: there is no labour-supporting party in the US; the D and the former R parties were both what globally would reckon as economically centre-right parties (competing for votes largely on non-economic social issues, like gun rights, abortion and militarism), and the current nominally-R administration is way over in the mid-to-far right space, driven by nationalistic populism. I will try to answer this from the point of a member of the Labour Party, I joined about a year ago. However, this is largely opinion based as I cannot read Jeremy Corbyn's mind! During the referendum campaigning, Corbyn was on the side of "Remain" but he did not campaign very actively at all and gave me the impression of being sat somewhat on the fence. He has generally been cool towards the EU and whilst not actively opposing it, he doesn't have a record of being a Europhile. Nobody knows what will happen if Brexit goes ahead so this position is not unatural, there will be pros and cons and neither option is clearly better than the other. So Corbyn's natural position on the EU and Brexit is to sit somewhat on the fence and so supporting a Soft Brexit, even as leader of the opposition, is understandable. The government's current position has (or now appears to be) for "soft" Brexit, ie staying in some kind of trading agreement with the EU. The White Paper that Theresa May is due to reveal tomorrow seems to be for limiting migration, but for keeping some of the rules/laws of the EU in return to free access to the common market. This is a pretty soft Brexit indeed but the EU will not agree to limiting migration, so the UK will have to have to compromise on that. At the end of the day whilst this would be Brexit in name, the reality is likely not much will actually have changed post-Brexit, other than the UK no longer having a say over how the EU is run and possibly paying less towards running it. Obviously this will depend on the how negotiations progress and nobody currently knows that. Another point is that a lot of Labour seats were more in favour of Brexit, so the party may feel it has to support Brexit as its core voters want it. This supports that premise. This is further backed up if you look in more detail at the opinions of those in Leave Labour seats, they don't see Brexit as a major issue. I suspect the Labour position will change over time and if hostility towards Brexit gathers pace (there is some evidence of this already) and they may support a second referendum. Keir Starmer has not ruled out another referendum and other MPs are now suggesting another referendum might be required. Also if the government tries to pursue a hard Brexit, or a no-deal Brexit, Labour would oppose this as it could erode workers rights, for example, as the government would no longer have to abide by EU laws. Bearing in mind most Labour MPs are Remainers, I think this also shows the party will oppose Brexit when they feel the time is right to do so. Finally it is worth remembering that the referendum was not legally binding and the government of the day can ignore it - the whole thing was brought about by the division within the Conservative party as they have a large number of Eurosceptic MPs. Not the answer you're looking for? Browse other questions tagged united-kingdom brexit labour-party or ask your own question. What are the residency requirements to vote in the 2015 U.K. Labour Party elections? Why did the Scottish National Party supplant Scottish Labour? Do incumbents in Labour party leadership elections need the support of 35 MPs? Does the UK Labour Party proposal to renationalise the railways include the UK component of Eurostar? What are some examples of antisemitism in the Labour Party? Where have most of the accusations of antisemitism in the labour party come from?